As George Zimmerman’s trial approaches, here’s to hoping no more young black men will become martyrs. Sean Bell was killed on November 25, 2006, in New York City. The night before his wedding, NYPD officers approached Bell’s vehicle outside a club and fired fifty shots at him and his companions, Trent Benefield and Joseph Guzman, on the suspicion that one of the young men had a gun and was intending to shoot someone. No gun was ever recovered, and while Benefield and Guzman survived the shooting, Bell did not. Officers Gescard Isnora and Michael Oliver (Oliver fired thirty-one of the fifty shots himself) were charged with manslaughter, reckless endangerment and assault, while Detective Marc Cooper was charged with two counts of reckless endangerment. In 2008, all three were acquitted of all charges. They remained on the force until March of last year. Bell was 23 years old. Oscar Grant was killed on New Year’s Day 2009 in Oakland, California. Officer Johannes Mehserle fired one shot into Grant’s back while he lay face down and restrained on the platform of the Fruitvale train station. He and his fellow officers were responding to a report of a fight involving about a dozen people on the train. Grant and his friends were identified as being involved in this fight and were confronted by the officers, several of them handcuffed, with Grant reportedly resisting arrest, which led to officers’ attempts to restrain him. Mehserle claims to have meant to reach for his taser, pulling out his gun and shooting Grant by accident. The incident was captured on several cellphone cameras. Of the three possible convictions, a jury found Mehserle guilty of involuntary manslaughter, the charge carrying the least amount of prison time. In November 2010, he was sentenced to two years minus time served, and was released on parole in June 2011. Grant was 22 years old. 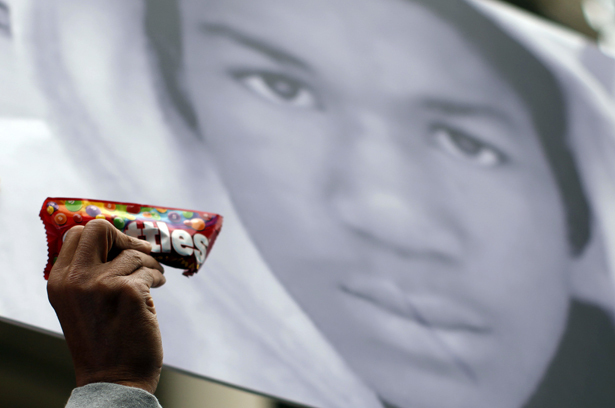 Trayvon Martin was killed on February 26, 2012, in Sanford, Florida. During halftime of the NBA All-Star game, he walked to a nearby store to get snacks for his younger brother. While returning home, he was spotted by George Zimmerman, a volunteer neighborhood watchman. Zimmerman called the police, and while they advised him not to follow, he disregarded this and approached Martin. A scuffle ensued that ended with Zimmerman shooting Martin in the chest and killing him. All that was found on Martin’s person was a wallet, a can of iced tea and a bag of Skittles. The police who arrived on the scene took Zimmerman in for questioning and later released him without charges, determining that under Florida’s “stand your ground” law Zimmerman had acted in self-defense. After forty-five days of national outrage and protest, Zimmerman was finally arrested. He has been charged with second-degree murder and his trial starts June 10. Martin was 17 years old. The details of each are different, and fiercely disputed by everyone involved, but each story ends the same way—with a young black man dead. It’s an all too familiar story, and I could go on and on, adding to the list many more names, but I mention these three because they have been the most high profile in recent memory and because they have become defining moments in my early adulthood. And I hate that. I have no desire to be anything but what I am—a black man—but I hate that part of what that means is walking through life prepared to die. I hate that I mark time by whether people were saying “I Am Sean Bell,” “I Am Oscar Grant,” or “I Am Trayvon Martin.” I kinda hate the “I Am…” rallying cry, because none of us are, because they are all dead. I hate the part of being a black man that’s forever conscious of what racism is capable of, and I hate that America thinks I need reminders. I hate that those reminders are Sean, Oscar and Trayvon. The naysayers and detractors say I and others like me are paranoid for no reason. To them, it wasn’t racism that killed these young men. These are simply unfortunate incidents, these colorblind optimists say, in part brought on by the actions of the young men who tragically lost their lives. I don’t hate people who think this way; I envy them. I’m straight-up jealous of everyone that doesn’t have to think about racism. I can only imagine how free they are. I’d like a life that didn’t involve me mourning young men I’ve never met as martyrs. There are people who can say, without laughing, that the election of the nation’s first black president means that racism, as a defining factor of American life, is over. I envy those people who are able to look at President Obama and see only progress. Like many, I was overcome with emotion I still can’t quite define that night in 2008 when Barack Obama was elected. But the thrill is gone and in the aftermath all I can see is Sean, Oscar and Trayvon standing behind him asking everyone “when does this end?” I’d like to think the lesson of their deaths is that racism eats the young and America would do well to abandon it, but history lends me a different lesson altogether, one which has me rigid with anxiety as we approach the trial of George Zimmerman. I’ve done my best to avoid any news regarding Zimmerman in the past year. In the age of social media that has been an impossible task, but each time something new has reached my eyes it has reaffirmed my decision to ignore it all. The news could only serve to remind me of the psychic toll racism takes on a country still afraid to call it what it is, and I’m full up on reminders. But I’ll be watching the trial closely, because I want this to be a turning point. I’m breaking out the rabbit’s foot and the four-leaf clovers while avoiding all ladders and mirrors. I’m hoping for change like an Obama campaign volunteer in ’07. I want this trial to mean a new day is upon us. Last year, while Zimmerman was still at large, I wrote, “The crime of killing a black person still is not greater than the crime of being black.” I want 2013 to prove me wrong. I want this moment to be the one where all those things I hate about being a black man, passed down from generation to generation, cease to exist. I probably sound as foolishly optimistic as people who think racism is already over. But I think Sean, Oscar and Trayvon deserve some foolish optimism on their side.